This entry was posted in Politics, Web/Tech and tagged 2010 election, foxx, kennedy, politics on October 25, 2010 by Jon Lowder. 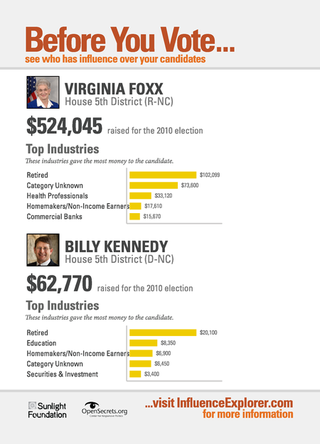 Jon- You should disclose to your readers that you are a contributor and supporter of Billy Kennedy, according to FEC.gov I think it is important if you are going to write about these candidates that you let the readers know your bias. Well, Ive never made it a secret that Im not a fan of Rep. Foxx going back many years on this blog. But its true that I contributed to Billy Kennedys campaign and I have no problem saying so. If its of any interest to you Im also a supporter of Sen. Burr, but I havent given any money to his campaign because I think it would be like spitting in the ocean. As for bias, Ill just point out that this is my personal blog and it is completely biased to my opinions. I dont have an editorial board and Im not paid by anyone to write it; its truly a hobby in my mind. Thanks for reading and thanks also for the comment.